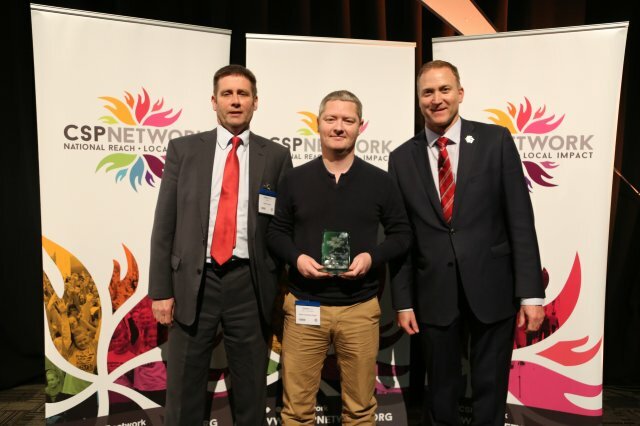 Our transformational programme Get on Track, delivered through North Yorkshire Sport in the area has won the prestigious County Sport Partnership Network (CSPN) National Impact Award. The employability programme took home the award in the 'Individual Development' category, at the annual ceremony, held recently at the CSPN Conference in Nottingham. Get on Track is a community-based personal, social and emotional development programme led by world class athletes. Run over a 14-month period, the programme helps young people facing disadvantage to realise the key attitudes and behaviours needed to make long term positive life choices. David Watson, Chief Executive of North Yorkshire sport said, "We are delighted to accept this award in recognition of the positive impact of the Get on Track programme on individuals in North Yorkshire. Our aim is to drive positive change through sport and physical activity, and that's exactly what Get on Track achieves, through our ongoing partnership with Dame Kelly Holmes Trust." Jane Ratcliffe, who has led the programme over the past 2 and a half years said, "Get on Track has successfully engagied with over 100 young people, with 89% entering training, education, employment or volunteering, and 60% specifically gaining employment. To be recognised by our peers in the CSP Network is a phenomenally positive achievement. We are really looking forward to launching the next phase of the programme in York this month." Emma Atkins, CEO at Dame Kelly Holmes Trust, said: "This award is real testament to the strong partnership we've had with North Yorkshire Sport over the past few years. It also recognises the transformational impact that we've been able to have on the lives of so many young people facing disadvantage in the region." "Our ambition is to expand our programmes into every area of Yorkshire & Humberside by 2020, and our partnership with North Yorkshire Sport will be crucial to help us achieve this and reach even more young people who require our support."